South Africa has been on my personal wish list for quite some time and in the last year or so I have made three trips there - two to experience the sharks of the Protea Banks and the third for the incredible Sardine Run. The Protea Banks are located about 8kms offshore from the town of Margate in KwaZulu Natal province on the east coast of South Africa and the diving there is not for the feint hearted.... It's deep and the currents are strong, plus the next stop is Antarctica if you get separated! But it is a biodiversity hot-spot and there are up to seven varieties of sharks to be seen there - depending on the time of the year. Some in absolutely amazing quantities! I documented the whole experience in an extensive eight-page article that has just been published in the global dive magazine X-Ray who did a really nice job of laying it all out. 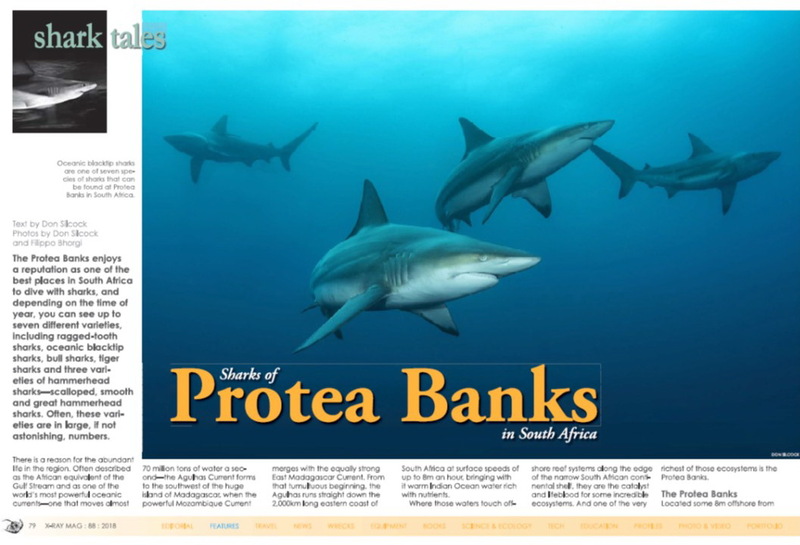 If you are interested in learning more about this special location and the sharks to be seen there you can read more and download the article on this link to the Sharks of Protea Banks article. Edited by Don Silcock, 29 October 2018 - 09:31 AM.